I'll not vanquish this from my playlist. Epic music is one of those genres that everybody knows about but doesn't really know actually exists as a genre. They just hear it every once in a while in a movie trailer or in the background of a Youtube video and go, "Oh, that song's cool." Little do they know that there is an entire world of epic that's just waiting to be recognized. Two Steps from Hell has easily put out some of my favorite music. I listened to their previous album, "BattleCry", so many times that I can easily say it's my favorite from them. 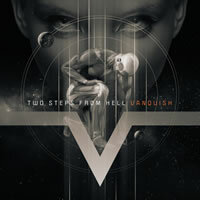 Two Steps from Hell is comprised of two composers Nick Phoenix and Thomas Bergersen. Even their names sound epic to me. I was so excited to see that their new album was coming out, I knew I had to review it and expose these awesome composers to you guys... if you like the epic genre, that is. I'll take it song by song. Fall of the Fountain World: This song has a very strong beginning introduction which is perfect to start out this album. I only wish there was actual words instead of "HOO AHH NAAHH" that utilize the singer's full potential. The woman has a powerful voice, use it! Anyway, I loved the overall power that this song has! The Fountain World ain't falling down so easily! The best thing is that the song keeps up that strength throughout the entire song. Pegasus: As usual, I love Thomas Bergersen's use of piano in epic music. However, after a few seconds, the song kind of sounds like a recycled melody from some of his other songs. There's a strong bass inset every once in a while that I thought was a nice touch. It started to sound kinda mish-mashed and random after a while, but Bergersen made up for it with the use of that soprano and chorus, though. Vanquish: The feathery vocals in Vanquish blend well with the equally awesome music makng it a great illustration of the power that voice and vocals can have on a song in the epic genre. The soft, simple ending just pulls it together. Well done, Mr. Phoenix. It's beautiful! New World Order: I was definitely not expecting the dramatic staccato chorus. This song hit me as mysterious and dramatic. It definitely reminds me of a battle sequence in some popular movie like Lord of the Rings. I have to say that it deserves to be used as a movie trailer score. Future Guardian: This song is more fast-paced with lots of elements that come together, but not really smoothly. The key change is a bit subtle, but it's still a nice touch. The only major disappointment was that the song didn't have much substance to it until it's almost over. Enchantress: I absolutely love the harp part in the beginning! The kid chorus? Not so much (then again, I've never been a fan of kids' choruses) It's a beautiful and complex song after that though. PERFECT blend of chorus and strings! Enchantress is a powerful, yet beautiful song. It's almost like it's telling me a story. It's whimsical and just outright fun to listen to. I could seriously battle for Narnia to this song. It's an absolute adventure from beginning to end and easily one of the best songs on the album. Final Kingdom: It's a nice song, but it doesn't really stand out. Even with the vocals, the music and melodies sounds like a summary of the previous songs. His Brightest Star Was You: Now this is a beautiful melancholic song as indicative of the title. The small touch of an electronic background melody was a nice addition. I don't know who "he" is, but this song makes me feel flattered to be his brightest star. Siege: The song puts you into battle right from the get-go. There's not really much depth to it, but at its surface, it's a pretty strong song. A bit repetitive though. I liked the fade-out. Evergreen: Evergreen started out feeling like a sailing song, but morphed into something different and light. Feels almost snowy, if that makes sense. It's one of the more upbeat songs. Loved the key change. By the end, this song makes me want to dance around a fire in the midst of winter. Stallion: It's definitely a different beginning which sets this song apart from the rest of the album! It builds up to a nice, strong crescendo and become very rhythmic, almost like a clock or the beat of a horse's hooves. Putting and electric guitar and an organ together? I was not expecting that, but it gave me chills so I guess it works well! And that sudden burst of strength near the end? I like it. Turin: Is Turin a dwarf from the Hobbit or something? I'm not sure what the song is about based on the title, but I'm guessing the composer was going for a rocky, earthy sound. He added something in there that sounds like someone hitting two forks together, but it fits surprisingly. Once again, the vocals are nice, but there's nothing really awesome about this song that makes it stand out from the rest of the album. High C's: If you want sailing music, here you go! SAILING MUSIC. High C's is definitely an adventurous tune. If you play this while cleaning your house, it'll be spotless within the hour. It has a high-energy, classical melody that makes you really feel like getting up and doing something. The song is unique and wonderful, but yet it seems a little scattered around at times with no real direction. Forge: This song has a simple melody that repeats for a little bit then just adds a different musical element each go around. It eventually evolves into another melody and starts the repetition process all over again. My overall thought is that there's not much complexity and too much repetition which makes the song a bit boring. Dangerous: Holy crap, this is a totally different song from the rest! Only guitar and voice to begin with. The main focus of this song is definitely on the lyrics which talk about some being who is, as the title, states, dangerous. The surprise twist? SO ARE YOU. My initial reaction was that this song definitely doesn't fit completely into the epic genre but more as a pop-ish song. I'm not saying this is a bad song though. I could totally hear this being on the radio. I give it a thumbs-up. Inferni: This song has a sudden twist in "attitude" several times (I'm not sure how else to put it). I was a bit thrown off by the chanting chorus and off-key piano near the end. Once I got used to it though, the song had already ended! Oh, well. I wasn't that interested in hearing much more of it anway. Overall, the album was decent, but pales in the quality of previous albums. There are a few songs like Vanquish and Enchantress that really stick out to me as being high-quality epic music, but the others were kind of similar to either each other or previous songs. I was a bit disappointed, but I still think the album is worth giving a listen to. Meanwhile, I'm gonna go listen to Star Sky and Battleborne because epic is epic and it's my favorite and I love it.